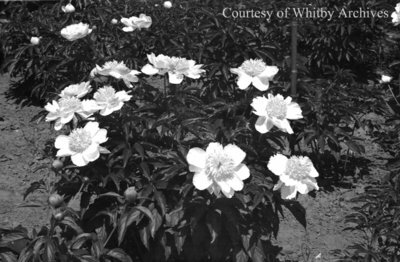 A black and white negative of flowers in the garden at 201 Pine Street. The house was located on the north-east corner of Mary and Pine Streets and was known as the Grange. This house was located on the north-east corner of Mary and Pine Streets (at 201 Pine Street). It was built in the 1850s and demolished in 1976. Owners of this house were the Armstrong family, W.H. Higgins, C.F. Stewart, J.B. Laidlaw, and Frank Lloyd Beecroft. The home was called "The Grange." Frank Lloyd Beecroft was a Whitby Lumber dealer who lived in the Grange from 1918 until his death in 1963. His son, Julian Beecroft lived in the house until it was demolished. The Grange, c.1937, Marjorie Ruddy. Whitby Archives A2013_040_666D.